Disposable sleeve for use with reusable cold/hot packs helping to extend the life of your packs. Internal size approx. 12.5cm x 34.5cm. These sleeves help keep your reusable cold packs from coming into direct contact with injuries thus minimizing cross-contamination. The sleeve is not made of ordinary plastic but a special form that is tolerant of high and low temperatures whilst also restricting fluid and air transfer. We recommend a new sleeve being slipped over a reusable cold/hot pack and end taped before using on the next individual. Keep several on hand. DID YOU KNOW? Our disposable sleeves can be end sealed with a heat sealer or even just a plain hot iron! If using an iron, remember to use a sheet of plain paper between the sleeve and iron. The plastic will weld together on the end but won't stick to the paper or your ironing board. 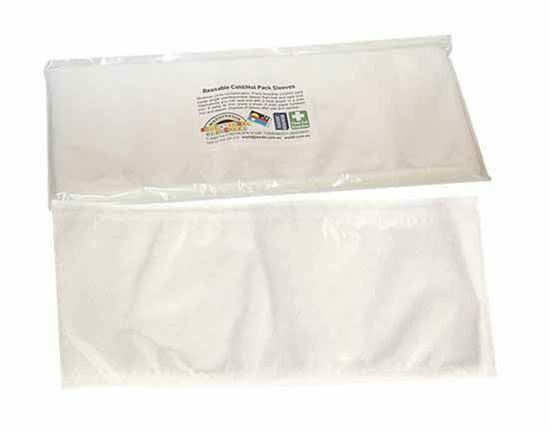 Why not keep a good supply of low cost cold packs on hand, already sleeved in batches. If buying more than 100, please order in pack quantities of 100.